plays an eclectic mix of music inspired by the various forms of American Roots Music including Blues, Funk, Rock n Roll, Soul, R&B, Bluegrass, and Gospel. Some songs may blend multiple genres together into a coherent sound while others might hang on firmly to a specific style. 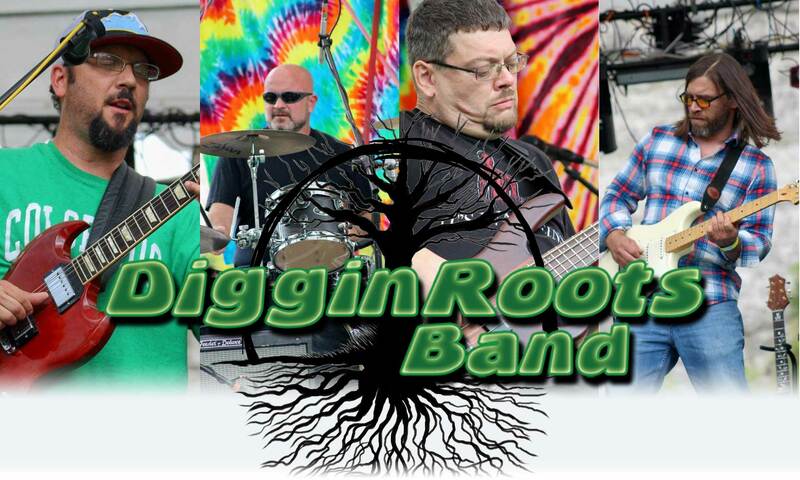 Hailing from the Buffalo/Western New York area, Diggin’ Roots Band was formed in the summer of 2013 by a group of friends who share a passion for the roots of American music. The band draws from a variety of musical influences such as blues, jazz, rock, bluegrass and folk music with a hint of “Jam Band” mixed in for good measure. Music is something most everyone has in common. It’s a way we can connect to one another and music is unifying and familiar. The sound of music can be therapeutic as well as healing while brightening a person’s day and enhancing their mood. The band shares a common belief that music is medicine and has the power to inspire and heal. Click Here to join our Mailing List! – We promise we won’t sell your email address or send you crap. But we will send you show updates, information on special events, and from time to time general information on what we’re up to. Check back often for an updated list of show dates! Keep up to date by joining our mailing list!